How to make a social networking website opensource project like facebook using asp.net,csharp,C#,sqlserver 2005/2008,Ajax,Webservice?? a) How stuff like facebook is made and how it works. b) How i get all the latest updates from my friends who are on facebook. c) How i get a friend request on facebook. d) How a message is send to my friends on facebook. e) How do i see my friends when they are online on facebook. f) How the chat is saved as thread on facebook. In this snapshot shows the home page. When any user will open this website for the first time it will be redirected to this home page. Register form contains the basic details like Name,EmailId,Password,Gender,Date of birth,Your Photo,AboutMe and users country.After entering all this details user can login. After thinking about all above questions i started thinking how will i make it and whether the social networking site like facebook that i will make will it work or not. I just wanted to make a basic version of social networking site like facebook so that i get a feeling that some what closer to facebook i have made it myself and that will encourage me to make it better and better and finally one day i may be able to make a very good version of my own social networking site like facebook. Making your own social networking site sounds great to me and i hope you will also feel happy to make it yourself. Now the question is how will you make it.To make your own social networking website you need to learn by yourself or need someones help to make. Here on my blog 20Fingers2Brains. blogspot.com i have given all the steps that are need to make a social networking website. For making this social networking website i have made use of the following technologies. You may have a question like why i used this technologies and why not PHP and MYSQL. But for developing a social networking site like facebook we are going to use dot net framework and technoloiges which do well with dot net framework . SQL Server 2008 A popular database provided from Microsoft .Mostly Used with Mircosoft Technologies as a Backend. To understand the entire code behind the making of social networking site like facebook lets first understand the overview of the basic version that i have Developed using the above mentioned technologies. 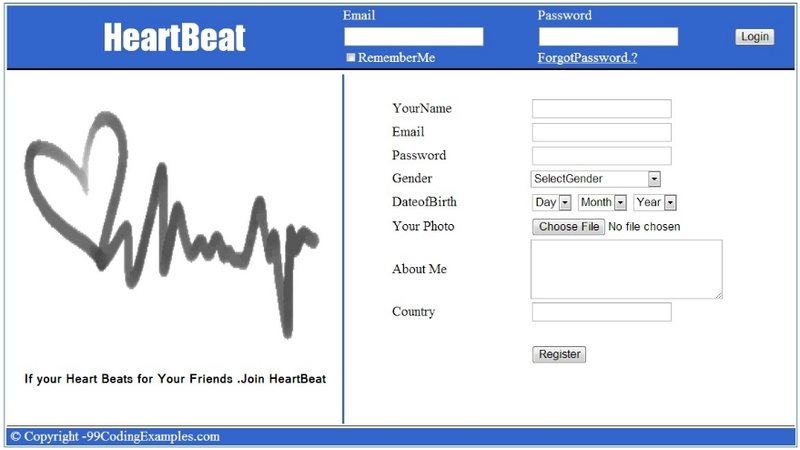 its good....can u pls send me the source code of this Heartbeat.com! ! my email id is raviprmr22@gmail.com i just need for reference though i also want to develop this kind of website as per my college project....pls help me. This is interesting. I think its time for my fingers get some exercise by doing some programming again. I hope you can share the source code with us for free. Thanks a lot. 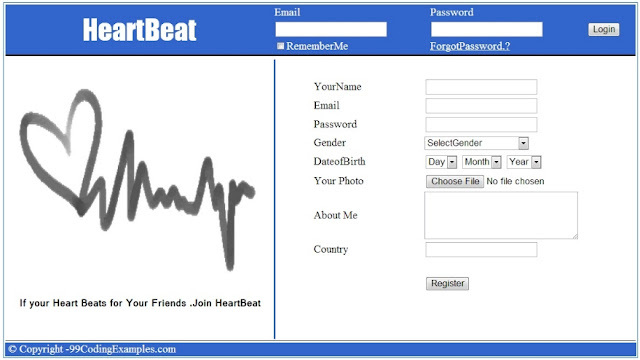 very good....can You pls send me the source code of this Heartbeat.com! ! my email id is " kaser.rahul@gmail.com "
i just need for reference though i also want to develop this kind of website as per my college project....pls help me. hey i need source code for your site :)..
Hi... These 2 Steps are really helpful towards beginning of our Project. It will help me a lot, if you are willing to give me the code of this project. can you send me source code? 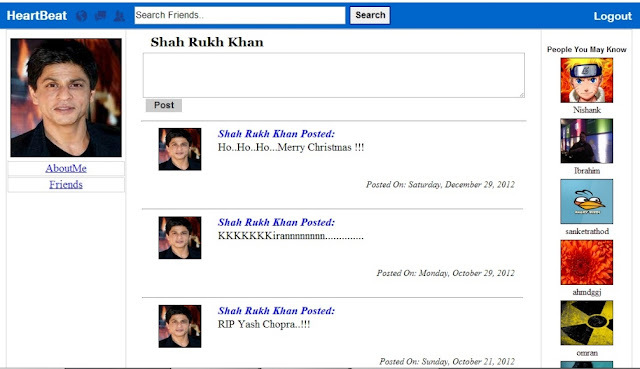 I m working on a social networking website... so please send me source code of this project. I m working on my final year project that was social networking website... so please snd me source code of this project.my email address is mahar.321@gmail.com. hey can you send me the source code of this site ? Make sure you dispose of the sourcecode? For my project, a booking engine, a social network would be great. can you send me the coding ? Plzz share me source code buz i m now going to working on project in college . Great sourcode! Could you please send me the source code? Thank you so much! It looks nice....Plz send the source code at "sudhakarchyvats@gmail.com "
May i have the source code for this ?I appreciate your works. It says source code with explanation, but I cannot download. Where is the source code? All of You can join RYMIYL ADMEDIA which is the best alternative of google adsense. They accept all traffic from all over the world for all languages sites. They accept adult and non-adult both websites. Their payment options are also very nice. This company (Rymiyl Admedia) is Indian based company. thank you very much for this amazing description. It is very helpful. If you could send me the source code @ taylom22@live.com I would appreciate it a lot! i am learning asp.net . . .
can you send me this code? Hi, Pls send me code to vndsekar.2001@gmail.com. hello sir, i am also developing the social network .it would be very helpful for me if you can send me the source code..u did really fantastic work..
can u please send me the code ? can you please send me the source code ? my email id is " coolshalini.ranjan1993@gmail.com "
this is good project.can you send me the source code? can you send me the source code? thank u....please send me Source code.. Thank you very much!! It s a big fortune for me! i glad to see this page! I forgot to write my email Id .Please send me on "ali.ashraf21@gmail.com". can i get this source code on my email id? Can you send this project. its very nice .fab work. can u pls send me the source code..
i kindly request you to send me. it will be helpfull for my college project. i hope u will send. Please send me the project code please at samblack661@gmail.com . it will be great help for project !!! please send this code !! please !! can I have the source code ,,, how can I get it ??? Please send me your source code to justawhitetk@gmial.com. Thanks alot! very very nice site.i also want to develop the social network site. Thanks for the wonderful article. Its very beneficial for us. Beginner C#, jQuery, SQL Server, ASP.NET MVC, LINQ and much more..
really very useful sir !! Thanks for the tutorial ! oh great ! can you send me the code at albertini.olivier@gmail.com, plz. Look great ! Do you have a repo ? Its very urgent.Really thanks in advanced!!!!!!!!!!!!!! hello i need this code please let me know how to get this.ramkriss11@gmail.com, 9705603289. Mr.Please help me with the source code . I need it for a school project . Please help me with the source code. Its just for reference. hi.... thanks for your help to complete Online Shopping Cart Project. Now i want to work with Social Networking Sites Projects,so do you have video tutorials for this project ? so that i will start to make it. could you send the source code "mohamedbadr.cs@hotmail.com"
its good....can u pls send me the source code of this Heartbeat.com! ! my email id is 100870131041.pitcse@gmail.com i just need for reference though i also want to develop this kind of website as per my college project....pls help me. Elgg developers at Social Engine India provides a full range of Elgg development and customization services including platform themes development, design and hosting. if you're still sending source code.....gtoreli@yahoo.com......awesome work!